Seeing students' developmental progress is a perk of teaching preschool. For individuals with an aptitude to work with young children, there are many benefits to being a preschool teacher. From not being tied down to a desk to reasonable work hours, being a preschool teacher can be rewarding work in a pleasant environment. Additional benefits include excellent job prospects and a strong potential for career advancement. The requirements to be a preschool teacher vary by state, as well as by school or center. Some childcare centers only require a high school diploma, whereas accredited preschool programs or public schools can require college degrees and teaching certification. The more education a teacher has usually means better compensation. 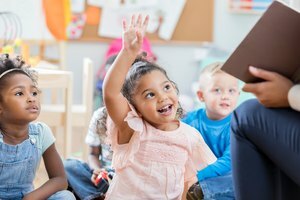 The possibility of advancement for preschool teachers is better than average, with the potential for progression from assistant teacher to lead teacher to director. One of the benefits of being a preschool teacher is the working environment. Preschools often have small class sizes in a nurturing atmosphere. Teachers are encouraged to be creative and playful in daily activities and have a substantial input in developing the classroom curriculum and schedule. Perhaps one of the biggest rewards of being a preschool teaching is seeing the developmental progress of the students. Beyond the relatively easy career entry and pleasant work environment, being a preschool teacher offers several other perks. The work schedule for private and public preschool programs is often similar to a regular school day, with summers and holidays off. Even preschools within larger daycare centers are usually closed for holidays, as well as offering part-time positions. Discounts on preschool tuition usually is available for the children of teachers. Larger companies and public programs often have good health care benefits, too. The No Child Left Behind Act has put a greater emphasis on early childhood education. According to the Bureau of Labor Statistics, preschool teaching positions are expected to grow by 19 percent by 2018, which is a higher average than all other occupations. Beth Griesmer’s writing career started at a small weekly newspaper in Georgetown, Texas, in 1990. Her work has appeared in the “Austin-American Statesman,” “Inkwell” literary magazine and on numerous websites. Griesmer teaches middle school language arts and science in Austin, Texas. Griesmer, Beth. "What Are the Benefits of Being a Preschool Teacher?" Synonym, https://classroom.synonym.com/benefits-being-preschool-teacher-6560387.html. Accessed 25 April 2019.